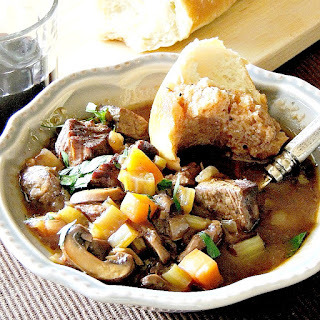 Slow Cooker Beef Stew - Red wine, mushrooms, and tender chunks of beef, make this the ultimate slow-cooked beef stew! A big ol' thanks to The Beef Checkoff for sponsoring this post. We seriously you! So, the typical Pacific Northwest weather has finally descended upon us. That crazy spell of 80+ days with no rain in sight, has been replaced by foggy mornings, and cool drizzly days. I am really digging it. I mean like super straight up loving this weather! But, talking about slow cookers, isn't there just something about Fall that screams out for slow-cooked meals? My little brain has been spinning with all sorts of ideas to pop into the ol' slow cooker. However, new deliciousness aside, nothing, and I mean nuuuuuuuuthing, tells my tummy that it is officially Fall like this rich and hearty beef stew. One bite and I am in stew nirvana, the perfect state of bliss. I think it could quite possibly bring about world peace because there is no way you can be grumpy with a tummy full of this stew. Guaranteed! Another thing that I love about this stew is that it is relatively inexpensive to make, but tastes like it cost a fortune. Stew beef is a perfect way to get your protein without breaking the bank and, I think it is pretty much a slow cookers best friend. The red wine just gives it such a deep rich broth, the beef is fall apart tender, it is just..... well it is just a whole bunch of awesomeness in a bowl , that's what it is. Today the Sunday Supper Family is sharing more tasty ways to incorporate beef into your family’s menu rotation. From braized brisket to steak fajitas, you’ll find loads of ideas. Check them out below the recipe! Want to add lean beef to your diet, but aren't sure about cuts, or how to cook them? Check out this handy dandy Interactive Butcher Counter. It not only suggests cuts, it gives you the nutritional breakdown and recipe ideas. 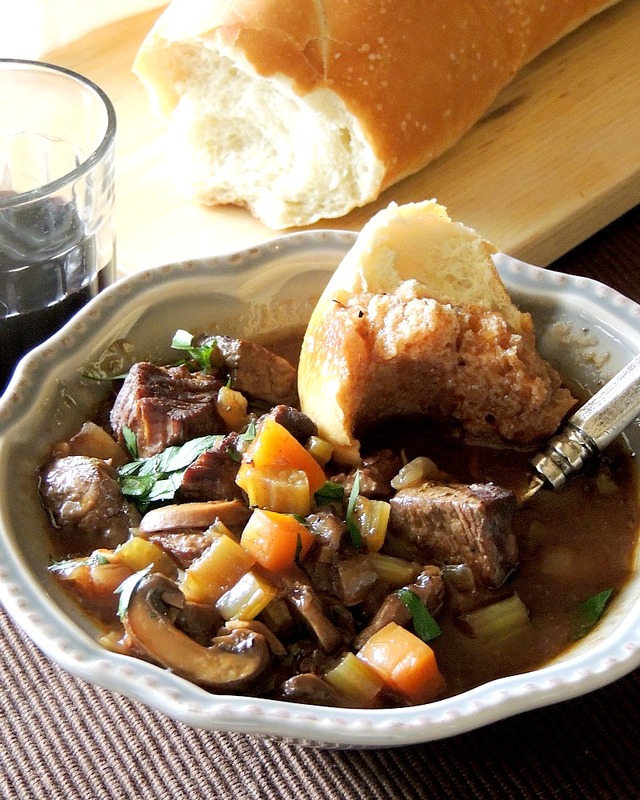 Red wine, mushrooms, and tender chunks of beef make this the ultimate slow-cooked beef stew! Place the peppercorns, thyme, rosemary, and bay leaves, onto a double layer of cheesecloth. Tie the cheesecloth into a bundle to make a bouquet garni, and place in the bottom of 6-quart slow cooker. 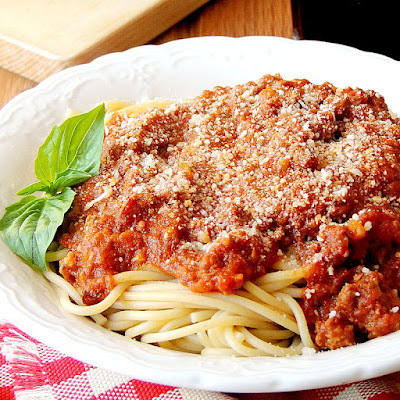 Heat 2 tablespoons olive oil in a large heavy bottomed skillet or dutch oven, over medium-high heat. Place 1/3 of the stew beef in a single layer in pan to sear. Make sure you do not crowd the pan. Let the beef sear without moving until it releases easily from the pan and the underside is golden-brown, 1 to 3 minutes. Flip the pieces and sear on the other side and let the meat sear without moving for 1 to 3 minutes, until they release easily from the pan. Remove meat with a slotted spoon and place in the slow cooker*. Repeat from * to * with the next 1/3 of the beef, and then the last 1/3. Add 1 tablespoon of olive oil to the pan and reduce the heat to medium. Add the onion and cook, scraping the bottom of the pot, until softened, about 6 minutes. Add the carrot, celery, and garlic, and continue to cook an additional 5 minutes. Transfer to the slow cooker. Add the last tablespoon of olive oil to the pan and cook the mushrooms until they have released all their liquid and are golden brown, 8 to 10 minutes. Place mushrooms in a bowl and set aside. Add the tomato paste to the pan and stir, allowing it to warm for a minute, then stir in 1/2 cup of the red wine. Stir to combine, scraping the bottom to remove any browned bits. Transfer to the slow cooker. Add the remaining red wine and stock. Cook on low for 6 to 8 hours. 30 minutes before the end of the cook time, stir the cornstarch into the cold water until it dissolves, then add it to the slow cooker along with the mushrooms. Stir to combine, then recover the slow cooker and continue to cook. Cut all of your vegetables (onion, carrots, and celery) the same size dice to ensure they cook at the same rate. The meat and veggies can be made the night before, then added to the slow cooker in the morning, along with the remaining ingredients. I love all kinds of beef stew and yours looks amazing. It's not too tomato-y and lots of sauce for bread dunking (my favorite way to get that last drop). 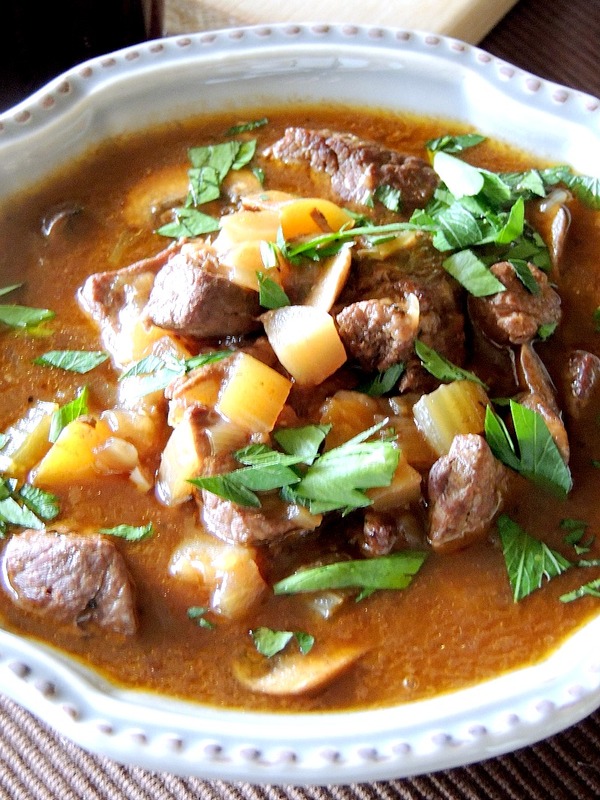 SO many delicious layers of flavor in your beef stew! I cannot wait to try it! I hope you do Liz. I seriously <3 this stew and have been eating it all week! I'm dying over this stew!! I want a double bowl please? And a HUGE chunk of bread. Oh yes, you must have bread!! Oh this beautiful stew has been teasing me all day! I can't wait until it cools off down here in FL! This is on my to-do list for sure! Perfect fall comfort dish! LOVE BEEF STEW! Oh yes! Fall and stew are BFFs for sure! Prettiest beef stew I've ever seen. 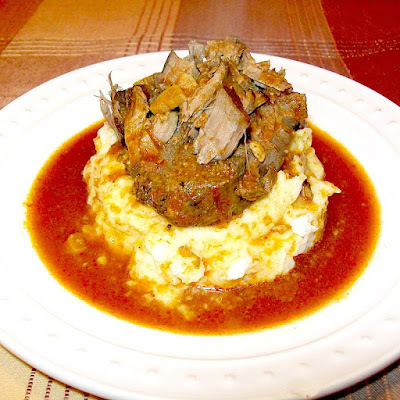 Always looking for new slow cooker meals with beef, and this is a definite winner! This looks so amazing! I want to dip a spoon into that wonderful broth. By all means Mary Ellen, dip away!! I will be right there beside you digging in! 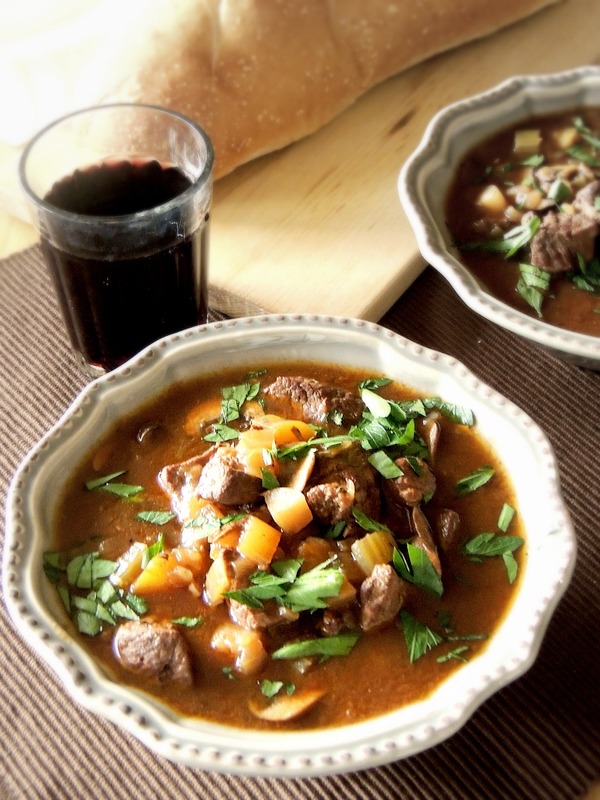 Beef stew is right up my alley! Mine too Cindy :) isn't it just the perfect Fall meal?